Upon reaching South Georgia Island late in the day today, we made straight for Elsehul, a small bay at the north end of the island. The island is rugged, with sea cliffs rising almost vertically from the ocean. The peaks above, some of which are hidden in clouds, rise to over 9,000′. They are covered in snow and glaciers. Glaciers lead from the peaks down almost to sea level and are clearly what has formed the many bays, inlets and notches to define the coastline. Gray-headed albatrosses are seen here, the first I have seen of them on the trip, flying alongside the boat and about the cliffs at Elsehul upon which they nest. 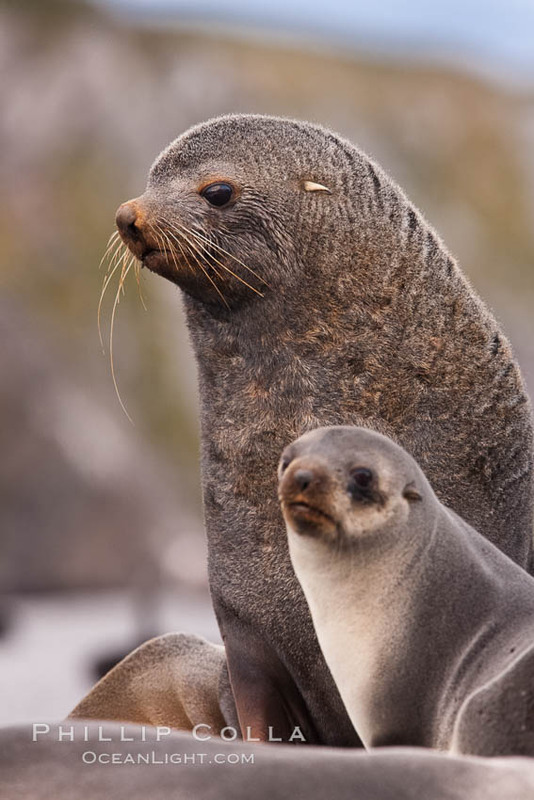 Antarctic fur seals are swimming in the waters of the bay. Using binoculors one can easily see that the beaches at Elsehul, however, are so plugged with fur seals that a landing is untenable, so we move down the coast to Right Whale Bay. After dinner the staff surveyed the beaches within Right Whale Bay and decided that there was room for us to land without disturbing the inhabitants, so at 7:30 pm we made for shore. Antarctic fur seals (Arctocephalus gazella) cover this beach too (a common theme for the trip, as we shall see). 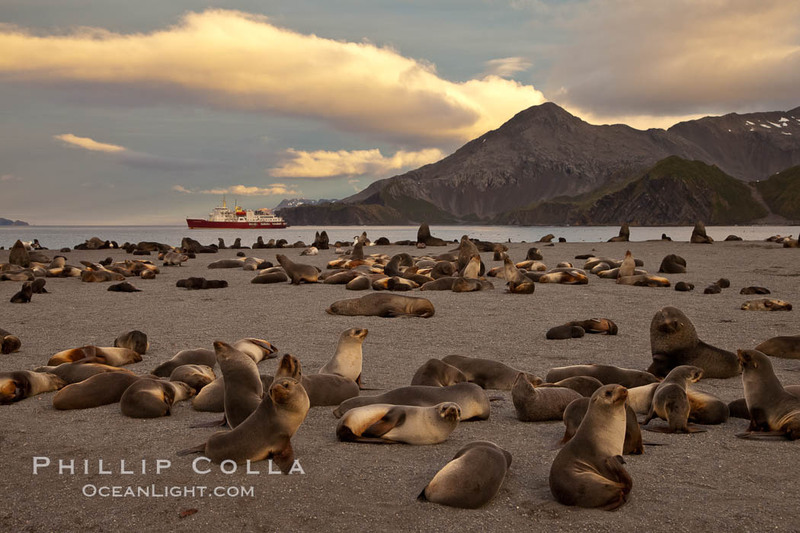 At our landing spot there are many bull fur seals (adult males) managing their harems of females. Occasionally a bachelor male will move too close to a harem, perhaps hoping to pick off one of the females on the outskirts and and try for a quick opportunity at mating, but usually the harem’s bull will quickly chase the interloper away. Pups are literally strewn about on the sand, small and black, some near there mothers while others gather in small groups a few yards away from the adults. About 100 yards in from the ocean the sand beach transitions to a gravel alluvial flood plain created by streams leading down from the mountains that rise so quickly above us. King penguins (Aptenodytes patagonicus) occupy much of the plain — singletons, small groups and gatherings of hundreds and thousands. Dead fur seals lie in the stream, testament to the difficulty of survival here. Giant petrels and skuas bury their heads deep into the carcasses, emerging with blood covered beaks draped with bits of entrails. Dominant skuas chase away lesser competitors from some of the better carcasses. 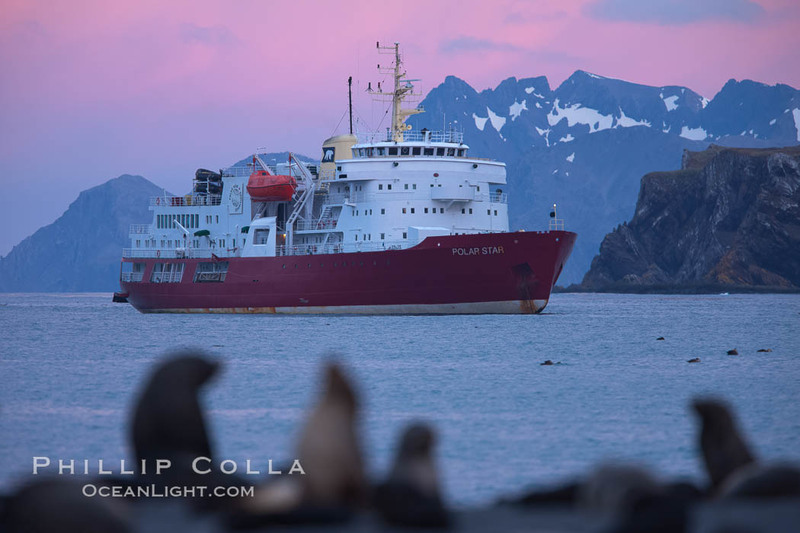 We walk along the outskirts of the fur seal colony, watching them and taking photographs. The sun is behind the mountains already and it is growing dark. About the time we must depart the beach and return by zodiac to the big boat for the night, we receive a final surprise: the clouds above catch their last sunlight of the day, lighting up with pink and orange. Awesome!